When it comes to saltwater fish there is one that stands alone as my favorite – Cod. 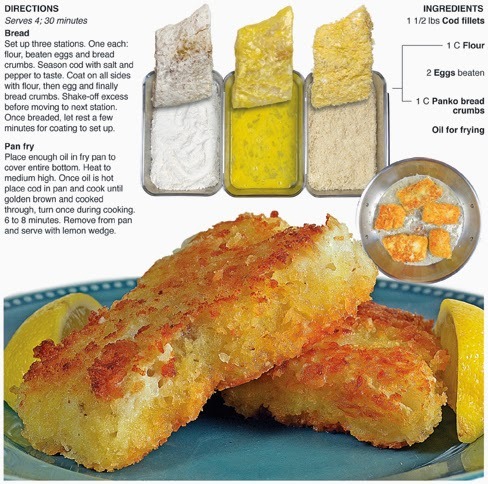 I love its thick fillets coated in a crispy breading or batter. It’s mild in flavor and not “fishy” tasting, which is why I like it. The Vikings would catch cod, dry it out and preserve it with salt, producing salt cod that could be taken on long voyages. In the 1600s the pilgrims used a map of New England made by John Smith to determine “Cape Cod” might be a good place to settle and profit from fishing, although they knew little about the trade, according to Mark Kurlansky, in his book Cod: a Biography of the Fish That Changed the World. Today, it’s available year round wherever fish are sold and can be baked, poached, braised, broiled and fried. 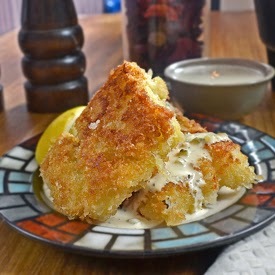 For this recipe, I dredge cod fillet in flour, egg and panko bread crumbs to create a thick coating made crisp by shallow frying in a skillet – which makes for large bites of moist and flaky fish with mild flavor and a nice crunchy breading for texture. Cod is by far and away my favorite type of fish to eat. When it comes to seafood in general I like mild flavor, the more “fishy” it tastes the less I like it. Growing up in the landlocked Midwest, my favorite fish was walleye, but after moving to New York and having a fish monger across the street, I gravitated toward cod. 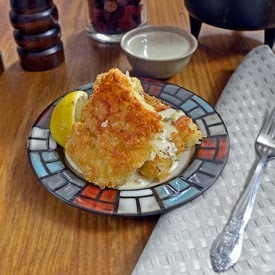 I saw Tyler Florence make fish and chips on the food network one morning and was inspired to make the dish myself. This introduced me to cod and it's now my go to fish. Since relocating to the Midwest in 2010, I have had hit and miss luck with the seafood here, my best bet is frozen, but even that can be a crap-shoot at times. Having said that, the frozen and thawed fish prepared and pictured in this post was excellent - as good as any fresh fish from my old fish monger in New York! Set up three stations. One each: flour, beaten eggs and bread crumbs. Season cod with salt and pepper to taste. 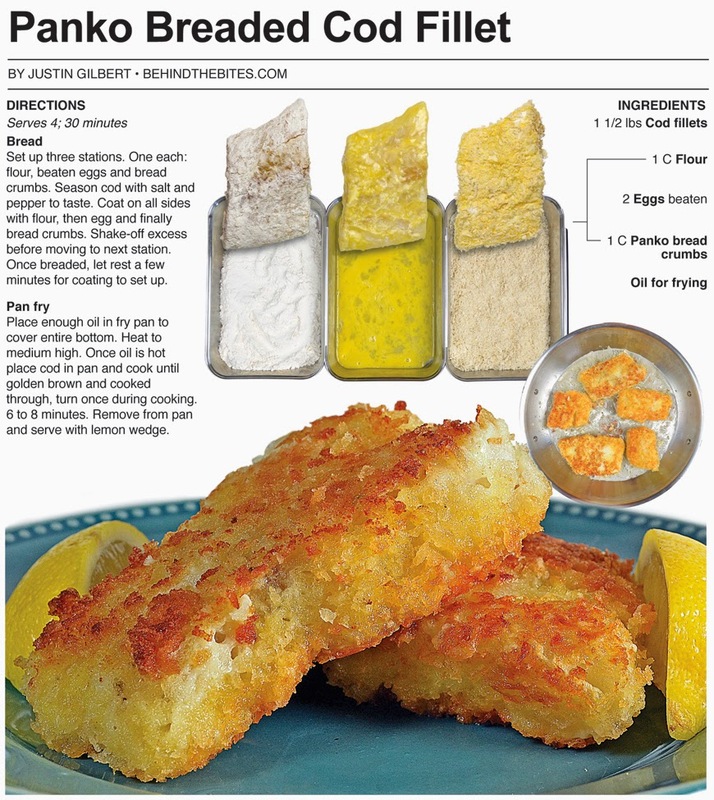 Coat on all sides with flour, then egg and finally bread crumbs. Shake-off excess before moving to next station. Once breaded, let rest a few minutes for coating to set up. Place enough oil in fry pan to cover entire bottom. Heat to medium high. Once oil is hot place cod in pan and cook until golden brown and cooked through, turn once during cooking. 6 to 8 minutes. Remove from pan and serve with lemon wedge.